The army may seem like an unlikely inspiration for a hotel, but it was the jumping-off point for Cavalry Court, a “military-inspired” 141-room motor court hotel, in College Station, Texas. The army may seem like an unlikely inspiration for a hotel, but it was the jumping-off point for Cavalry Court, a “military-inspired” 141-room motor court hotel, in College Station, Texas. Designer Rottet Studio chose corrugated metal and vintage brick to form a Spartan palette, while details, such as pool cabanas resembling field tents, complete the kitschy theme. Due to its proximity to Texas A&M University, the hotel features 6,000 square feet of indoor and outdoor event space to accommodate meetings, weddings, and receptions. 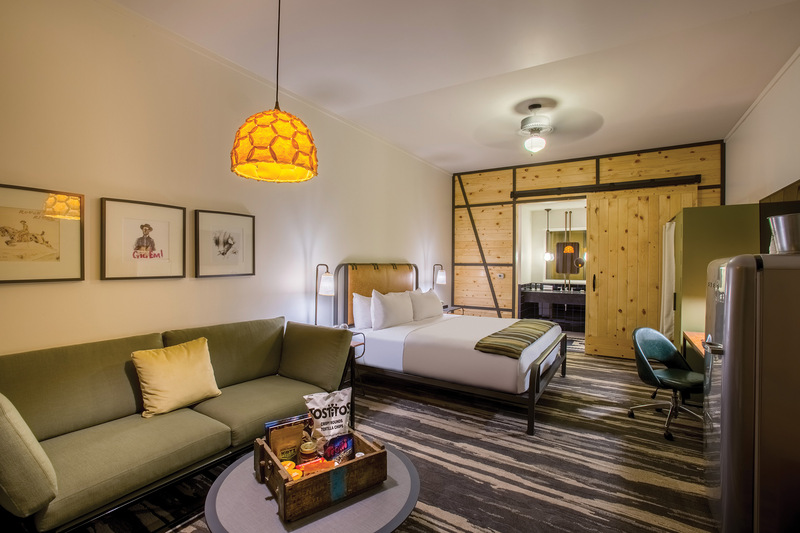 Appropriately, guest rooms and suites have been dubbed “barracks” and “officers’ quarters” (but are sans soldier-style bunk beds), and “gourmet Texas cuisine” is served at the Canteen Bar & Grill. “Like the motor courts of yesteryear, Cavalry Court’s aesthetic coupled with Texas A&M cadet history uniquely captures the true essence of College Station, of Texas, and embraces a bit of Americana,” Valencia Group president Doyle Graham Jr. said in a statement. Cavalry Court is near part of Houston-based developer Midway and Valencia Group’s 60-acre Century Square, a mixed-use development adjacent to the A&M campus. The George, a more upscale boutique hotel, will be located next door.